Amazon Reader's Review: "Alan Epstein takes you in his book on a wonderful and enchanting journey to The Eternal City of Rome. I can relate to Alan and his family. I was in Rome in 1999 and fell deeply in love with this wonderful city and the infatuation hasn't left me ever since. This book is one of the finest about Rome. Alan takes you into the heart of what daily encounters are like in Rome. Among the people, the beautiful style of the women of Rome, how the bambini are cherished in Rome, and most of all the wonderful food of this magnificent country. Beware: once you read As The Romans Do you will be quickly taken and find yourself rather quickly booking yourself a one-way ticket to Rome. Great job Alan! 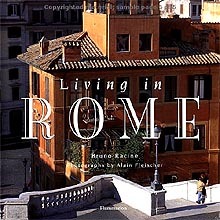 This is for sure my favorite book on my favorite place of Rome. A great tribute to the Eternal City!" With five chapters exploring the beauty of Rome, including its architecture, gardens, interiors, museums, and artisans' and antiques shops, plus a "Connoisseur's Guide," award-winning writer Racine and Fleischer, a filmmaker and photographer, present a side of Rome rarely observed by the casual visitor. Though not as comprehensive as the now-classic Blue Guide: Rome (Norton) or as practical as Dorling Kindersley's Rome (from the "Eyewitness" travel guide series), this is a work of love and passion. In elaborate detail and with delightful photographs, Racine and Fleischer capture the essence of the city, but in a manner that is of little use to everyday tourists. Those who want to enjoy the breathtaking depth of the city and are intrigued by the extraordinary and those with an intellectual inclination for understanding Rome will certainly find the volume enjoyable. In this informative new book, Frank Korn reveals long-preserved secrets of the Eternal City. Where else but in Rome will you find a church with the name "Where are you going?" Or be able to take an ancient lie detector test? Or peer through a single keyhole and see three sovereign countries in one shot? These are among the scores of fascinating oddities, offbeat features and unexplored places that Korn discusses. Learn about the cupolas of Rome, tracing back to the 6th century; discover the rioni fountains, which symbolize the interest or character of the neighborhood where they are located; or observe the pagan priest of the Vatican, a famous 1st-century marble sculpture. Korn reveals how tourists, while rushing through the "must-see" sights of the city, are missing treasures like these, steeped in just as much history but without the crowds. If you just don't have time to luxuriate in the bubble bath whirlpool tub of Georgina Masson's Companion Guide to Rome, then treat yourself to this book, the next best thing, which also details many one-day trips like Assisi, Palestrina, and Frascati. An accomplished chef, restaurateur, and documentary filmmaker rediscovers the extraordinary delights of his native Rome after an extended, decades-long absence. Although standard travel guides focus on Rome's infinite number of prominent and offbeat tourist sights, Romagnoli concentrates on the people, the feelings, the shared history, and the unique culture that epitomizes a less tangible, far more tantalizing aspect of Rome. By contemplating and analyzing the city's human texture, he provides an insider's view into the central core of one of the world's urban treasures. While strolling through the districts and streets of his beloved Roma, he encounters and interviews countless natives willing to share their unique perspective on the Roman persona and lifestyle. Both the Rome of antiquity and the modern city are well represented in this distinctive tribute. Those on their very first visit will be grateful for this splendid guide. This is a book for those who have been there, and those who would like to be! It provides the religious pilgrim with contemporary details and historical traditions surrounding the important churches and shrines of the city. Delightful insights into the Eternal City. Fleeing Hitler's invasion and arriving in Rome from his native Vienna in 1938, Hofmann made Italy his home for the rest of his life. Former bureau chief for the New York Times, he is a prolific travel writer, best known to Italianists as the author of Rome: The Sweet Tempestuous Life (1982), O Vatican (1983), Cento Città (1988), and That Fine Italian Hand (1990). Like these previous works, The Seasons of Rome is a light, breezy account of a year in that bewildering, beguiling, and often exasperating city. Like most travel literature--and like the Romans themselves--Hofmann's book refuses to take itself too seriously, and therein lies its charm. At times he sounds like the neighborhood curmudgeon, complaining about left-wing students, motorscooters, and the Democratic Party of the Left (the former Communist Party). Tellingly, Hofmann confesses that he does not consider himself a Roman by adoption- -even after more than half a century in the city. Rather, he is "still a foreign observer with my inevitable prejudices. . . ." But it's precisely this distance that allows him to reveal the foibles, folly, and even nobility of that ancient/modern Roman race. Each chapter is devoted to a month of the year, and we realize how intimately tied the Romans are to their climate, whether the wind that dumps sand from the Sahara on their city or the late summer rains that bring relief from the heat. Above all else, the author reveals how the Romans define the Italian arte di arrangiarsi, or the art of getting by; from avoiding paying their utility bills to dealing with local politics. The next best thing to actually being in Rome.